Orphan Joey Tilly Is Growing Up Cuter Than Ever! Tilly has come a long way since The Australian Reptile Park staff rushed to her aid after she had been rejected by her mother. Head of Mammals, Dean Reid, came to the rescue by becoming Tilly’s surrogate mum. This involves bottles of specially formulated milk every 5 hours including a feed at 2am every night and ensuring she is kept toasty warm in her knitted pouch. Tilly is a part of The Australian Reptile Park’s vital conservation breeding project to help save the threatened species. Yellow footed rock wallabies were once found throughout New South Wales, Queensland and South Australia. However, they have now disappeared from New South Wales and Queensland with their numbers in the wild estimated at being as little as 5,000. Their decline is attributed to intense hunting in the 1800s and early 1900s for their pelts and in recent times, the introduction of feral pests such at the fox and cat. 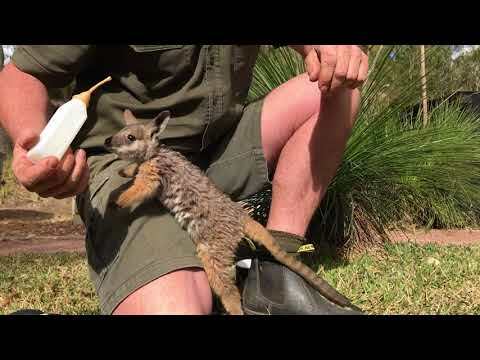 Tilly has already stolen the hearts of thousands of Australians with a video of her having a bottle posted on The Australian Reptile Park’s Facebook page gaining over 70,000 views with followers commenting on how small and adorable the gorgeous joey is.